The new Hino 700 SR1E. HINO Motors Sales Malaysia Sdn Bhd, the official distributor of Hino commercial vehicles in Malaysia, has added a new model to their 700 series product range, the HINO SR1E 6x2 heavy-duty prime mover. 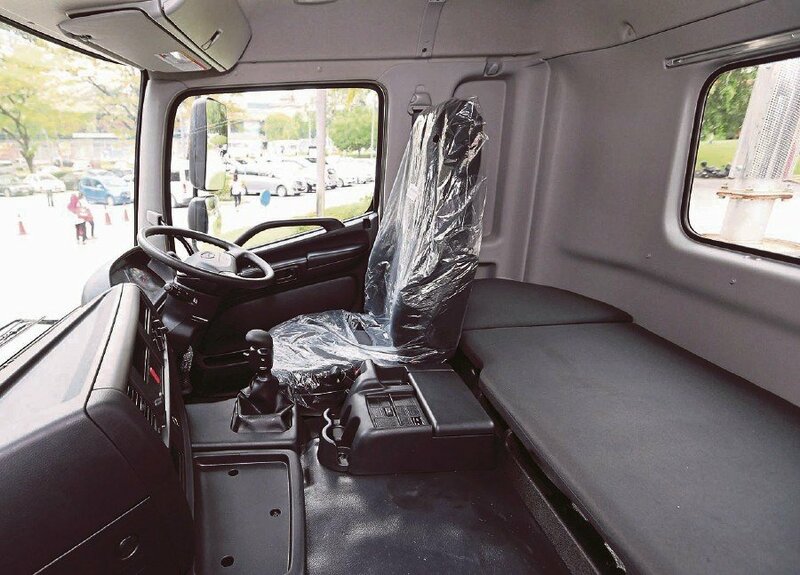 “Hino sees that Malaysia has potential in developing continuous market field to commercial vehicle industry as land route and ground transportation is the main distribution mechanism to most of the logistics industry in the country,” said its managing director, Ken Iwamoto, at the launch. The Hino SR1E is powered by a 13-litres six-cylinder Euro3 common rail turbo-charged intercooler engine, paired with the MZ12 manual transmission. It generates 414 hp at 1,800 rpm and 1,903 Nm of torque at 1,100 rpm. It is designed for GCW (Gross Combination Weight) of 66,000 kg. One of the key features is the lift-able third axle. It is to improve the operational flexibility and it also helps fuel-saving when the lift-able third axle is lifted up during travelling without a heavy load capacity. Driver’s seat in the Hino. The Hino SR1e prime mover is also equipped with full floating cabin, air suspension driver seat, lift down switch, cab steps and inside grip for easy cab accessibility, large overhead console, optimised cab with better visibility and spaciousness, multi-info display, shift knob with hi-lo switch, full air brake system, front under-run prevention, energy-absorbing steering column, reflector headlamp, headlamp leveling switch and double side mirrors. As for the safety features, it includes the anti-lock braking system, a set of SRS airbag, engine protection system, anti-spillage fuel cap and door impact beams. The Hino SR1e is covered by a one-year unlimited mileage warranty for the chassis and two-year or 200,000km which ever comes first warranty for the power train, with terms and conditions apply. As road safety and after-sales value is one of the key concerns of Hino, the company has set up the Hino Total Support Customer Centre in Sendayan, Seremban, Negeri Sembilan. At the centre, customers and drivers have the opportunity to undergo several training programmes that emphasised on safety driving skills, safety and eco-cien driving, driver familiarisation and many more.